While Manhattan’s avenues were snarled with slow-moving traffic during Tuesday’s snowstorm, Coney Island Beach was as tranquil as the moon. 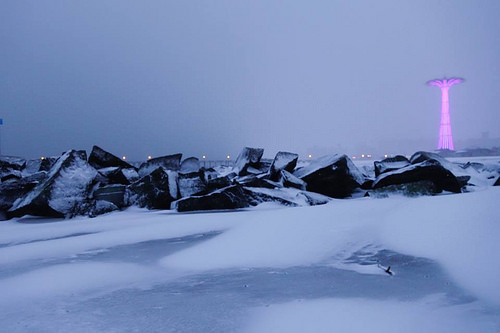 In this striking snowscape by Coney Island photographer Bruce Handy, Steeplechase Pier peeks out from behind snow-dusted rocks as the Parachute Jump shimmers in the distance. I love, love this pic. Finally something tranquil in a hustle bustle city. Thanks for sharing!